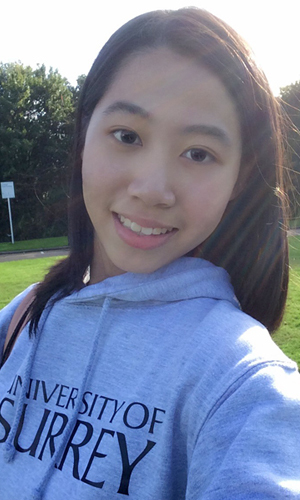 MA Interpreting (Chinese Pathway) student Xiyue Cai shares a typical week for her as a postgraduate student at Surrey. “All my lecturers are professional, patient and happy to help. They create a dynamic leaning atmosphere in class and always encourage us to be critical and bravely put forward our own opinions. The teaching methods are all student-centred and the feedbacks on each of my assignment are pertinent and detailed. The facilities at Surrey are excellent — we have great interpreting booths and bright group study rooms equipped with computers. We can book them online anytime. The library is open 24/7, even during the holiday period! The FREE English Language Support programme (ELSP), Global Graduate Award (GGA) and SPLASH learning development offered by the university are an excellent opportunity for me to improve my language and academic skills and to make the most of my time here at Surrey. Accommodations guaranteed policy, meet and greet service, orientation programmes, visa-related issues and free End-of-Year Lunch – I received a warm welcome and great assistance as an international student. Learn more about our language degrees, including our MA Interpreting (Chinese pathway).